The S. W. Betz Company offers a number of different sizes and types of casters, including light duty, medium duty, medium heavy duty, heavy duty, general and v-groove casters. It is important to make sure that you select the right type of caster based on various conditions in your facility (or where the caster will be used). The first condition you need to consider is the floor surface on which the caster will be rolled. If it is imperative that your floors require protection, then you should select a more resilient caster. If capacity is more important than floor protection, a metal caster will work best for you. If you want a combination of both, a polyurethane caster is recommended. The next question that must be answered is “What are the floor conditions?” Are there pieces of debris on the ground (i.e. metal, cardboard, packing materials, etc.)? Will the caster be used in extreme conditions (heat, cold, etc.). If you have harsh chemicals or are in an environment that needs to be kept sterile, such as a hospital, this can affect the type of caster needed. The next piece of information that is needed in determining your caster need is capacity. If too much weight is being put on a caster, it can affect its ability to function properly. It is generally a good idea to purchase a caster that has a much higher capacity than what you think you will need. Your selection of caster should be large enough so that it can overcome obstructions and transport your load with minimal effort. The S. W. Betz Company has been helping its customers with their caster needs since 1933 and represents many of the top manufacturers in the country, including Superior Casters and Payson Casters, which have been manufacturing casters since 1873. If you are in need of, or would like more information on, any of our casters, please contact us and one of our team members will be happy to assist you. 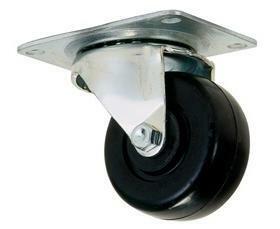 For more information about Casters or any other product or service from S.W. Betz, fill out and submit the form to the right.